Have you heard the old adage “if you don’t use it, you lose it”? Does this really happen? If so, to what degree does one “lose it”? I was riding dirt bikes since the age of three, began racing motocross at age six and ‘retired’ –moved from home and went to graduate school – around the age of 21. After 18 years of riding and racing, I know I can still swing my leg over a seat and take off and ride much better than most. But, I could not go as fast as I once could. I would not have the technique nor would I have the strength power or endurance to ride for long. What about my neural impulse and reaction – that would be nonexistent, wouldn’t it? Countless studies have demonstrated the positive correlation between practice and reaction. I haven’t practiced and with my luck, I’d hit a rock and run in to a tree. I’ve been working with a client who was a long-time distance runner. Subsequent to injury, she was forced to put away the running shoes. She went from marathon training, down to 7 miles, down to walking and eventually to nothing. I began working with her and after two months of corrective therapy, we began developing motor control and optimal function, which appeared lost. We are now several months in and with continued refinement of motor control and performance development she is slowly getting back to pre-injury condition, but still have a long way to go. My story and her story triggered the question of reversibility, or the loss of performance due to inactivity? Looking at information from the web it is clear there is a lot of broscience – anecdotal reports made by fitness ‘experts’ are considered more credible than scientific research (i.e. “Dude, after your workout, you need to eat a can of tuna, 3 raw eggs and 4 tablespoons of peanut butter, so that you can get anabolic man!”) – that exists and has become common practice. So, I did some digging to find the physiological effects of reversibility, specifically, how much do we lose and how fast do we lose it? 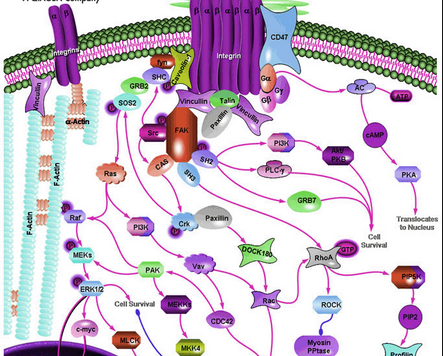 Integrins, which facilitate cellular signaling. discovering the importance of cellular physiology in training and are starting to manipulate training principles so that cellular responses are maximized. I previously published two blogs (mechanotransduction and cryotherapy) that discuss cellular signaling, the manipulation of cellular response through exercise, which facilitate healing and optimize rehabilitation. These advances in research have significance to reversibility. There are many reasons why inactivity yields physiological loss. A study by Flueck and Wouter in 2010 discovered that activity of mitochondrial proteins is reduced by nearly half after 2 weeks of inactivity (1). The authors linked this deficit to cardiopulmonary degradation with decreased stroke volume and reduced maximal oxygen uptake. Another study demonstrated oxygen uptake/utilization of trained endurance athletes took as long as 3 months of inactivity before declines were noticed (2). So, aerobic deficits are identified as early as 2 weeks or as late as 3 months. Not surprising, anaerobic metabolic function is also impaired during periods of inactivity. In less than 2 months of inactivity, glycolytic enzymes like lactate dehydrogenases and phosphorylases can be reduced back down to pre-fitness levels (3). Detraining also leads to decreased muscle fiber size. A study published in JSCR, 2010, showed cross-sectional area of muscle decreased after one month and tendon stiffness returned to pre-training levels in two months of inactivity (4). When you think about it, four weeks of inactivity is not long and we can experience significant reversibility in this time. Do you alter training programs to accommodate for this loss? The link between injury and immobilization and muscle atrophy is well documented. The rate of atrophy has been linked to length at which the muscle is immobilized. Dupont, et al., found significant differences of gastrocnemius and soleus atrophy when the ankle was casted in plantarflexion versus dorsiflexion (5). During inactivity, the genetic signaling processes are reversed when compared to that found during exercise. Protein degradation is expedited while protein synthesis is reduced (6), leading to catabolism overtime. However, if we apply load we might be able to retard muscle wasting. In my Mechanotransduction blog, I explain how exercise stimulates gene expression and protein synthesis. Sessions of passive stretching applied daily and three times a week were effective in inducing serial sarcomerogenesis (7). A study published in 2010 found that even very little training is enough to off-set reversibility and performance loss when compared to total inactivity (8). The opposite occurs during bouts of inactivity. In as little as 2 weeks of inactivity reversibility occurs. The more trained an individual, the longer reversibility will take to transpire. Rate of reversibility is also influenced by pre-existing fitness levels. Those demonstrating higher fitness levels will have slower rates of degradation; while the less fit will experience faster rates reversibility. Overtime, reversibility will take place in all individuals who become inactive, but the significance of physiological change can be minimized or even halted with very minimal activity. If you are an athletic trainer, physical therapist, strength coach, or personal trainer you should gain an understanding of your client’s history. It is imperative to ascertain his/her pre-existing training levels and the length of inactivity. This information will provide you an understanding of how fit the individual is and can guide your decision-making when developing short-term and long-term goals. In regards to the client referenced in the opening; we have an individual with great pre-existing fitness levels that had significant reversibility take place due to a several month layoff. Clinically, this information is vital to ensure program design and periodization addresses the physiological loss. Following corrective rehabilitation our program must be systematically designed to restore neural control, muscular coordination, flexibility, strength, power, speed, agility and quickness so that we can optimize performance enhancement. Fletcher, I.M., and R. Arness. 2007. The acute effects of combined static and dynamic stretch protocols on fifty-meter sprint performance in track-and-field athletes. Journal of Strength & Conditioning Research 21(3): 784-787. Mujika, I., and S. Padilla. 2001. Cardiorespiratory and metabolic characteristics of detraining in humans. Medicine and Science in Sports and Exercise 33(3): 413-421. Ross, A., M. Leverett, and M. Riek. 2001. Neural influence on sprint running training adaptations and acute responses. Sports Medicine 31(6): 409-425. Kubo, K., T. Ikebukuo, H. Yata, N. Tsunoda, and H. Kanehisa. 2010. Time course of changes in muscle and tendon properties during strength training and detraining. Journal of Strength & Conditioning Research 24(2): 322-331. Salter, A.C.D., Richmond, F.J.R., and Loeb, G.E. 2003. Effects of muscle immobilization at different lengths on tetrodotoxin-induced disuse atrophy. IEEE Trans Neural Syst Rehabil Eng. Sep;11(3):209-17. Jackman, R.W., and S.C. Kandarian. 2004. The molecular basis of skeletal muscle atrophy. American Journal of Physiological Cell Physiology 287(4): C834-843. Salvini, TF., Coutinho, EL., Russo, TL and Deluca, C. 2006. One-minute Bouts of Passive Stretching After Immobilization Increase Sarcomerogenesis in Rat Soleus Muscle. Braz. J. morphol. Sci: 23(2), 271-277. Garcia-Pallares, J., L. Sanchez-Medina, C.E. Perez, M. Izquierdo-Gabarren, and M. Izquierdo. 2010. Physiological effects of tapering and detraining in world-class kayakers. Medicine and Science in Sports & Exercise 42(6): 1209-1214. Good stuff josh. Really suits me being an ex MMA fighter now turned nursing student. I wonder how much I’ve lost already. As you are aware, MMA takes hours of training to establish strength, power, and metabolic demands of the sport not to mention hours of rehearsal and practice to properly execute an arm bar or how to defend from getting caught in a rear-naked choke when an opponent has your back. While you may never forget how to do a movement – how strong, fast, powerful, and reactionary your movements are do regress with time off.